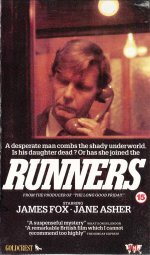 With his teenage daughter on the disappearance list for two years, James Fox refuses to accept that she's dead and sets out on a journey to London to find her. He meets Jane Asher, the member of a self-help support group who has lost her son, and his neurotic search turns from a contemporary social issue drama into a fully blown cryptic thriller. Idiosyncratically written by Stephen Poliakoff, directed with an accent on documentary realism by Charles Sturridge and well performed by the sympathetic Fox, this compact drama succeeds in engaging the attention and holding it until the anticlimactic ending.